On the list of things most important in life, I’d say the birth of your first child-or rather, ANY child-ranks an easy #1. But it seems not everyone agrees. 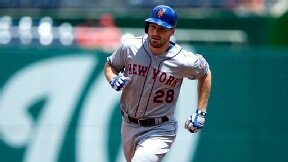 New York Mets second baseman Daniel Murphy missed the season opener, as well as three other days while on paternity leave to witness the birth of his first child, as okayed by Major League Baseball. “Quite frankly I would’ve said ‘C-section before the season starts. I need to be at opening day. I’m sorry, this is what makes our money, this is how we’re going to live our life, this is going to give our child every opportunity to be a success in life. I’ll be able to afford any college I want to send my kid to because I’m a baseball player,'” says Esiason. Carton didn’t necessarily agree with something as drastic as an elected early C-section, and said “no one can blame you” for wanting to be there the DAY your baby is born, but taking three days off? That’s excessive. “Twenty-four hours, you stay there, baby is good, you have a good support system for the mom and the baby, you get your___back to your team and you play baseball,” Carton said. Really, guys? REALLY? First off: it’s good to note that the people commenting here are men-MALES-who have never given birth, never will give birth, and know nothing about giving birth, recovering from labor, or what a brand new mother needs as far as support and “help” goes. Admittedly, I’m probably about as naive about the importance of opening day in MLB as these guys are about hypnobirthing. HOWEVER…as important as being there for your teammates on this “should-be-a-national-holiday” season opening game IS…being there for your wife as she brings your son into the world is INFINITELY MORE important. And the suggestion of recommending a C-section is maybe one of the most absurd things Esiason could say. Cesarean sections are MAJOR surgical procedures, and are not to be taken lightly or just “scheduled” around the parent’s schedules. They are usually reserved for emergencies. Last I checked, opening day is not an emergency. I guess when you live in the sports world day in and day out, you get a little bit oblivious to the real world. Carton and Esiason have clearly not established perimeters for what is important and what is not. Sports are important. They are great entertainment. The athletes who dedicate their time and talents to their teams are appreciated in a big way. Sports teach work ethic, structure, commitment, being coachable, learning to work as a team, setting goals, and, if you’re good enough like Murphy, provide a great living for your family. But sports are not the most important thing in life. They are important! But not THE most important thing. Family is. And the argument that Esiason was trying to make about Murphy owing it to his family to be at the game because he’s providing a living and making a “better life” for his kid is just plain silly. The same could be said of anyone in any profession. If you’re a doctor, lawyer, banker, teacher, garbage truck driver, or McDonald’s manager, every husband is trying to provide for his family. Why should it be any different for a professional baseball player? He’s got a salary. He’s going to get paid no matter what. It’s the law. It’s also an MLB law that he was allowed to take a three-day paternity leave, which he did, and then get back to the greatest GAME ever played. It is, at the end of the day, a baseball game, although many people try to make it out to be a holy and sacred and revered experience. But I know from experience, and no doubt Murphy does now, too, that the most holy, sacred, and revered day is the day a new life is brought into the world. The first time the baby cries, the first time a new mother and father touch their baby that they created…that is most sacred day I can think of. It appears these sports announcers have either forgotten or never experienced that, which is a sad shame. For Daniel Murphy to say, “I’m going to be with my wife while she brings my son into the world,”-as easy as it is for ME to say, “Obviously!”-must have been a tough decision to make and kudos to him for keeping his heart where it’s supposed to be. For more on the story read TODAY online here. To see the YouTube clip of Boomer and Carton discussing what women need when and after giving birth, click here. What do you think of Murphy’s decision to take a three day paternity leave for the birth of his son?